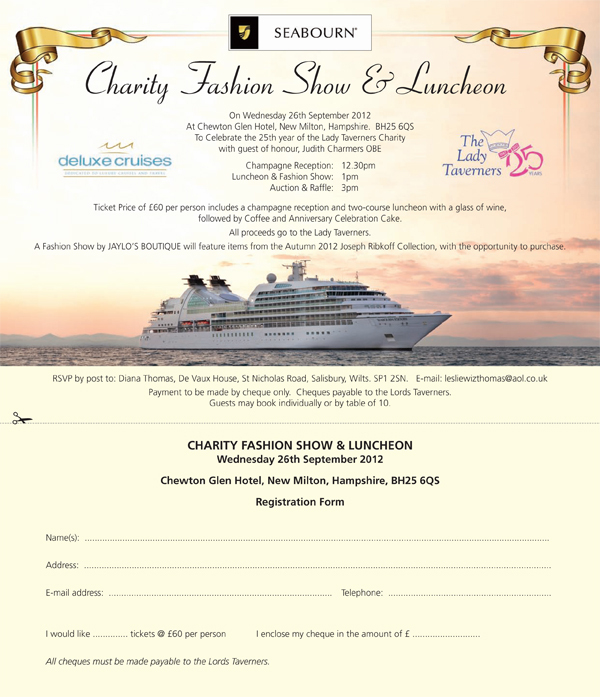 Join us at our Charity Fashion Show & Luncheon at the Chewton Glen Hotel to be held on 26th September 2102. To celebrate the 25th year of the Lady Taverners Charity, in conjunction with Seabourn Cruise Line, we are holding a Charity Fashion Show and Luncheon. Our special guest of honour will be Judith Chalmers OBE. Tickets are priced at £60 per person and includes a champagne reception and two course luncheon with a glass of wine, followed by Coffee and Anniversary Celebration Cake. All proceeds will go to the Lady Taverners. A fashion show by JAYLO’s BOUTIQUE will feature items from the Autumn 2012 Ribkoff Collection, with the opportunity to purchase.